Though every patient’s cosmetic smile issues are unique, most of them share the desire to improve them as conveniently as possible. That’s one of the reasons why dentists in North Hollywood, CA, often recommend porcelain veneers for addressing such concerns. With the ability to closely mimic the healthy and blemish-free appearance of your natural teeth, porcelain veneers offer highly lifelike results when improving your smile. However, their appearance isn’t the only reason why modern veneers are popular, and today, we take a look at a few more. Veneers are wafer-thin shells that are bonded to the front surfaces of one or more teeth. Because they replace the visible structures of your teeth, it’s important for them to carefully and accurately resemble the color, shade, and light-reflection qualities of your healthy teeth. 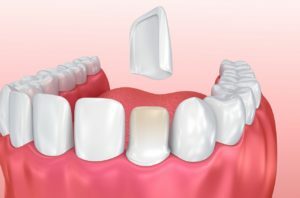 Dental porcelain, which is semi-translucent and highly customizable, can more closely recreate these qualities than many other dental materials. Dentists and patients alike prefer porcelain veneers because of their highly lifelike results, but also because of their ability to address several types of issues. Because veneers are designed to recreate the entire front surfaces of blemished teeth, they’re able to instantly improve their appearance whether the teeth are stained, chipped, cracked, too small, unevenly spaced, or more. Their versatility helps patients who have multiple cosmetic issues enjoy a more attractive smile with fewer treatments. Once your custom veneers are in place, they’ll blend in almost seamlessly with your smile, which not only makes them mimic healthy teeth but also makes them easier to care for. Good hygiene practices like brushing your teeth twice a day and flossing at least once helps ensure that your veneers and the teeth they support remain healthy and free of blemishes for life. Customized porcelain veneers are popular among dentists and patients for several important reasons. For more information, or to find out if porcelain veneers are right for you, schedule a consultation by calling Modern Smile in North Hollywood, CA, today at 818-763-9353. We also proudly serve patients who live in Burbank, Toluca Lake, and all surrounding communities.